Spec-wise, the U4919DW offers a 3800R curve radius, 109 pixels per inch and a brightness rating of 350 cd/m² (typical). Response time is rated at 8ms in normal mode and 5ms in fast mode and the contrast ratio is 1,000:1. A single USB-C cable can be used to transmit power, data and video, helping to reduce cable clutter. Other connectivity options include two HDMI 2.0 ports (HDCP 2.2) (10-bit color @ 60Hz), a single DisplayPort 1.4 connector (HDCP 2.2) (10-bit color @ 60Hz), five USB 3.0 downstream ports and two USB 3.0 upstream ports. The IPS display allows users to view content from two different PCs thanks to its Picture-by-Picture (PBP) feature, much like a true dual monitor setup but without the annoying bezels. Similarly, the KVM feature allows you to toggle between different machines using a single keyboard and mouse. As you’d expect, the display is height adjustable and can tilt and swivel to help lock down that ideal viewing angle. It’s also compatible with VESA mounts and stands should you already have a mounting location in mind. 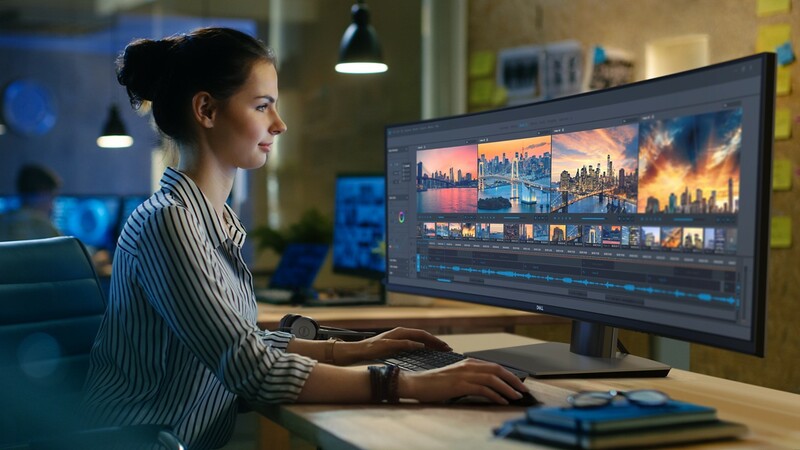 The Dell UltraSharp U4919DW comes backed by a three-year warranty and launches on October 26 priced at $1,699.99. Most professional gamers use 3 screens, and for them this would be a downgrade. And watching full-screen video is no fun on it. No 4K support, and any video will be on just 50% of the screen in the middle, which is crap. And low vertical resolution makes sure this product won't attract professional graphics designers or video editors. So really, this very much a niche product. In fact, I'm having difficulty imagining who would want it. P.S. It would make a killing if it were 8192x2048, to fit 2x4K screens, and could be even playable on a rig with 2 x RTX 2080 Ti. They are targeting people who like the format, which isn't necessarily "enthusiasts." A guy at Microcenter tried to sell me on a 32:9 monitor a while back (I prefer 21:9 and told him as much) but I referred someone who I figured would be interested and they went straight to the store and picked one up. As it turns out, there are more people to sell to than just gamers and video/photo editors. LNCPapa and Darth Shiv like this. For that price tag.... I'll pass. But imagine setting it up vertical and using it for coding! Yes, that was a joke. This is not for gamers but for productivity (like programers) and the price isn't that bad. Darth Shiv and davislane1 like this. I have two Dell U3415W set side-by-side (2 x 21:9 @ 3440x1440). I'm a software developer and graphics designer and use these aspects all day long. I like the ultra-wide appeal as it is very useful for work. Others might say this monitor has limited appeal, but I personally am attracted to this. This isn't for gaming or for watching movies and maybe not perfect for graphics design, but seriously, first world problems... We can't all be track stars. Faplyboy and TomSEA like this. Yeah for me it would be great in software that can setup window layouts nicely e.g. Visual Studio. VS benefits greatly from multimonitor setups but not having the bezel between the windows would be a great improvement still. For a gamer, the pros that I've heard talk about this say 24" is still the go. Field of view for this monitor would make it difficult for optimal play. There are probably genres that this suits well too like space flight sims and so on. Some day-traders might be interested in this. That's the dumbest resolution I can imagine for something like this. Stretching the screen wider & wider like a stick of gum is NOT desirable. I mean you wouldn't get this if you are a PRO gamer. You would get higher refresh rate single monitor. Aspect Ratio issue is the biggest killer of UWs. If supported its an amazing experience, if it isnt, its a bummer. Monitor of this scale should be at least 1600p, I guess if you need horizontal space for timelines etc, this is great. The 38UC99 (now a version old) is 1600p which is the top vertical resolution available for UWs atmo afaik. Id say we are 2-3 years away from a 4k Ultrawide with HDR and 60-120hz. OLED UHD 30" to 42" (120fps) range monitor would be amazeballs. It's curved, you would probably value vertical space over UW. The 3840x1600 is a better fit for a developer, or dual/tripple 4k/8k. As someone pointed out, traders and audio engineers / video editors and people in favor of multi-window productivity views will value this greatly. I'll take the girl. She is super cute. Dell can keep the monitor, especially at this price. didn't notice that it's curved. thanks for telling me. I hate curved screens. what kind of software are you developing? Its hard to get used to at first, but it has its upsides. I barely notice mine at 38", bigger you go, less apparent it is. Unless you go with Samsung, their curve is quite hard. Agreed. I have an LG 34” flat and I upgraded to the curved 34” Dell model (U3415W) and it’s subtle enough to make a difference but not massive like other brands. I found myself leaning left or right to see content better on my LG, but not so on my Dells. I primarily do web related software development but also do native desktop and some IoT (kiosk). You name the platform and I’ll probably find an excuse to program on it. Recently been moving more toward hardware related development as this is an area I really would love to steer my career into, especially now with how easy it is to get into it with the advent of microcrollers and cross-platform language support.